Many of us know people who seem to have a simple time sharing their faith. or causally talking about faith with everyone at the family reunion. No fear in them at all. However, many of us can be paralyzed by our Evangelism Fears. But what about those who are more introverted? 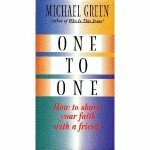 How do we share our faith? 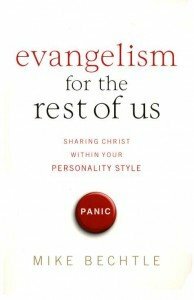 This is the question that Evangelism for the Rest of Us: Sharing Christ within Your Personality Style, Mike Bechtle, seeks to address. “God designed us with a specific purpose in mind. So we could do what He wants us to do, in the unique way that nobody else could do it. Why should we try to do it differently? … When introverts spend time trying to function like extroverts, they’re doing more than just wasting time. However, most programs designed to teach evangelism assume that a person is outgoing and confident in situations like talking to complete strangers in a public setting. “I’ve found that when I try to share my faith in unnatural ways, my fear gets larger and tends to stop me from sharing. That kind of fear almost always signals that I’m sharing out of guilt instead of compassion. But when I share in ways that fit with God’s design for me, a creative tension compels me to look for new ways to move forward. Bechtle really seeks to develop a way that those of us are a little more on the introverted side can still feel pretty natural in sharing our faith. The book doesn’t really go into the mechanics of sharing your faith (your Personal Testimony, God’s story, any gospel scripts illustrations). Rather, he seeks to show introverts conversational settings where they can feel comfortable in talking about their faith. He does seek to show biblical methods of evangelism, and conversational skills that are matched to your personality. Over all a good read and one that is worthy of your dime. 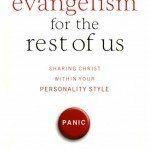 Order your copy of Evangelism for the Rest of Us: Sharing Christ within Your Personality Style, Mike Bechtle from Amazon, and I’ll get a little tip from them. 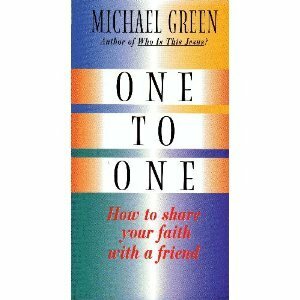 I’ve been recently reading “One To One: How To Share Your Faith with your Friend” by Michael Green (unavailable from Amazon). Jesus displayed constant and profound care for those he called lost: lost in loneliness, separation from God, defeat, lack of purpose in life. The Holy Spirit was given to us to fulfill his plan to reach the lost. It is the Holy Spirit who goes before us to prepare the way, and empower us to full his plan. We’ve been entrusted with the Gospel — therefore we are his ambassadors. The greatest joy on earth — to see one come to faith in Christ. This morning, my taxi driver shared with me that, he was at the bedside of a lady dying with cancer. As a family friend, he was called in to be with the family. The lady was slipping in and out of consciousness, and clearly was in her final moments. With great passion and urgency, he shared the gospel with her, in a gentle and non-obnoxious way, not knowing if she was receiving the information, or what God might be doing. It’s hard to know what is possible in a situation like this. Could she comprehend, could she respond if she didn’t have the ability to speak any more? The lady opened her eyes, squeezed his hand and said 4x, yes, yes, yes, yes. Then her final breath, and she passed into eternity. It was a brief story my taxi driver told me. But he did share with me the greatest joy on earth — seeing this woman come to Christ and hear her declaration of faith in Him, just before she died. He’s excited to share his faith, and is propelled with great joy to continue to do so. He routinely shares his faith with those on the streets, who have no home, and he notices people that God underlines for him. Who can you share your faith with today? 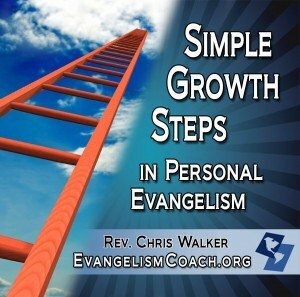 If you want to prioritize evangelism, learn some simple steps of where they can grow.